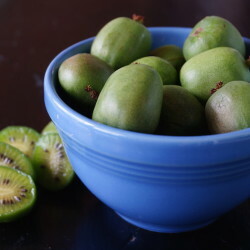 Kiwi berries are a unique, grape-sized berry that tastes like a fuzz-less kiwi fruit! Pick-your-own kiwi berries right off the vine in our orchard. The riper fruit is larger and has a slightly lighter green color. Don’t wait until fruit is soft on the vine to pick it. Use a small container for picking. A 4-5 quart box works well. They will be firm when you pick them but will become more delicate as they ripen. The berries will need to ripen for 3-4 days at room temperature after picking. If you place them in a container with a banana or tomato, this will help the fruit ripen more evenly. Find inspirational recipes for using this unique fruit in recipes on our blog and on Pinterest!